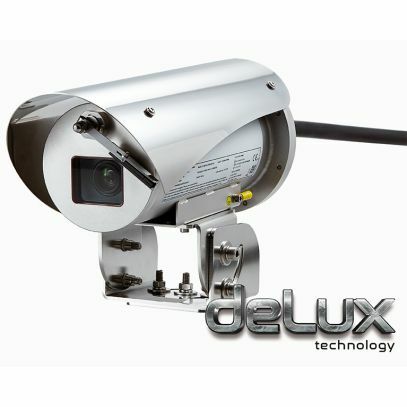 MAXIMUS MVX DELUX is an explosion-proof FULL HD camera which integrates new imaging and encoding technology for video surveillance, allowing recordings to be produced with incredibly bright and vivid colours both by day and by night. In particular, thanks to the camera’s increased light sensitivity, the DELUX technology can obtain bright images with well-defined colours in very low light conditions – even typical night-time conditions to 0.006 lux (0.0006 lux in black and white). MAXIMUS MVX DELUX is a Day/Night Full HD 1080p camera with 30x optical zoom and a frame rate of 60fps. It is capable of precisely identifying the details in a scene, even in dynamic, rapidly changing situations. The video images are sent via the network with compression H.264/AVC, MPEG4, MJPEG or JPEG and up to a maximum of 3 simultaneous and independent Full HD video streams. The housing is compact yet functional and is made entirely out of AISI316L stainless steel. Its resistance to corrosion is not only guaranteed, but is also enhanced by way of polishing processes. An equally noteworthy point is that the IP66/IP67/IP68 ratings guarantee the complete protection against harsh weather and submersion in up to 5 metres of water for 2 hours. Moreover, the IP69 rating allows the device to be cleaned with high pressure water jets. Another important feature of the camera is the extended certification temperature range of -60°C to 65°C, along with a sophisticated cold start system, which allows it to operate in harsh environments as standard. The MAXIMUS MVX series products are Lloyd's Register Type Approval System Test Specification Number 1 certified and therefore can be used in Marine and Off shore applications for environmental categories ENV1, ENV2, ENV3 and ENV5 ( eg. passenger ships, open-air decks, closed spaces and technical areas that may be subject to heat generated by other equipment, potentially explosive areas, docking procedures).